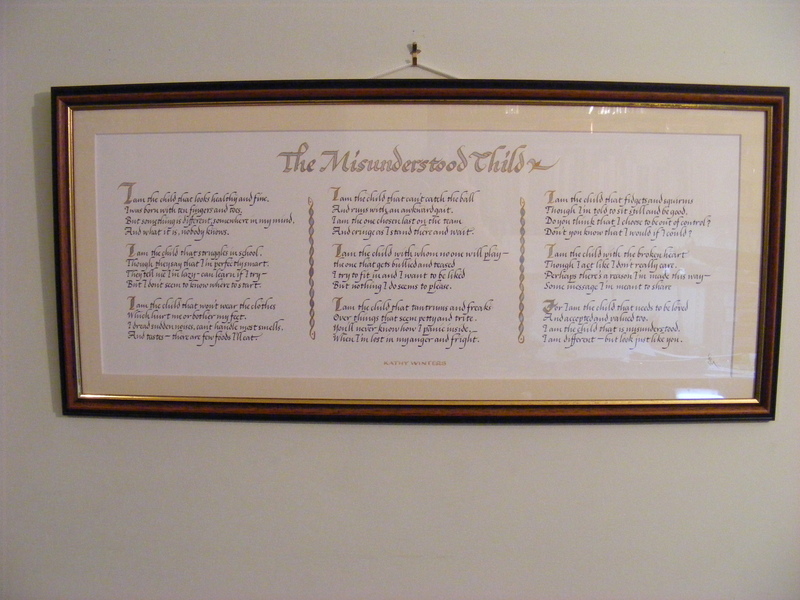 A few weeks before Christmas, a Bill’s Space reader got in touch and asked if I had time to write out a poem, ” The Misunderstood Child”, by Kathy Winters, to be given to her daughter who has a son who has been diagnosed with ASD (Autistic Spectrum Disorder)”. On completion the client agreed to my showing the making of the piece here on the blog as an aid to demonstrating how such a project is taken from the bare text to a framed, finished piece. We both thought, also, that it might raise public awareness of this condition. Here is the Poem as I received it. I am the child that looks healthy and fine. I was born with ten fingers and toes. And what it is, nobody knows. Though they say that I’m perfectly smart. But I don’t seem to know where to start. Which hurt me or bother my feet. And tastes — there are few foods I’ll eat. And runs with an awkward gait. And I cringe as I stand there and wait. But nothing I do seems to please. Over things that seem petty and trite. When I’m lost in my anger and fright. Though I’m told to sit still and be good. Do you think that I choose to be out of control? Don’t you know that I would if I could? Though I act like I don’t really care. Some message I’m sent to share. And accepted and valued too. I am the child that is misunderstood. I am different – but look just like you. So we have 9 verses of 4 lines. The first thing to establish is the format. One row? Two rows of four with one centred under? Or the one we decided on, three rows of three? Having decided this and bearing in mind time and budget constraints we agreed that a black italic script with gold and blue title and versals was the way to go. Using my preferred method of line spacing, see Workshop and Hints and Tips, It was an easy job to write out the longest line, x height 1/8″, on a piece of scrap to establish the complete width required, 26″, and write the text with a fine italic nib and roughly pencilled capitals on to a nice new sheet of Fabriano watercolour paper. Remember, two clicks to magnify each picture. 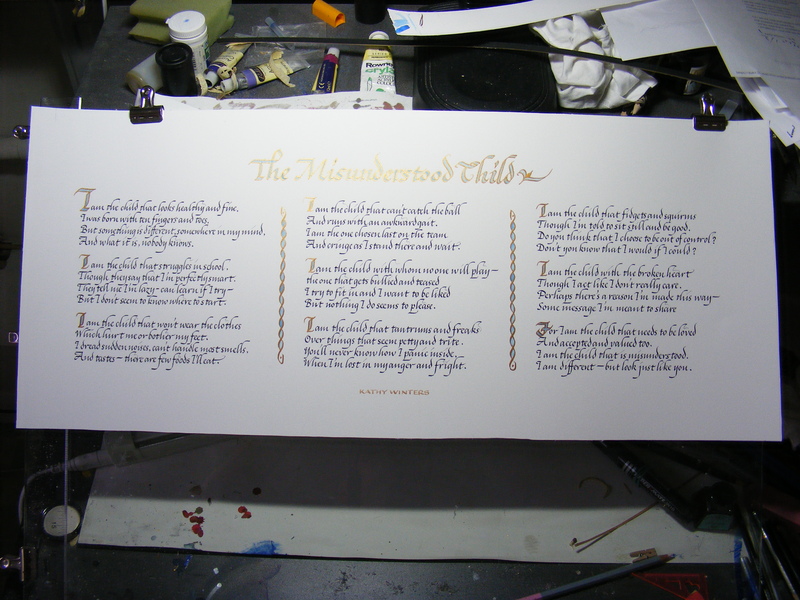 Then with double pencils shaved down so that the tips were just 1/16″ apart, the title was written in after first being roughed out on a piece of scrap. 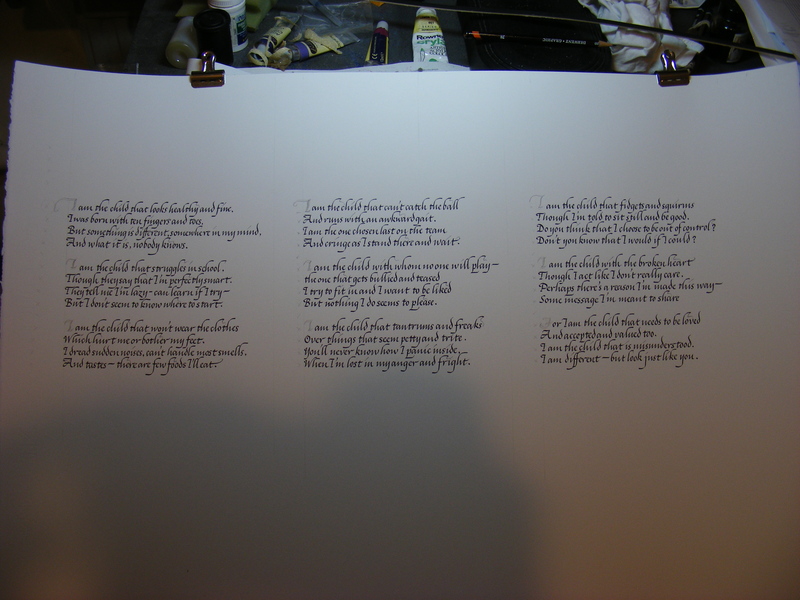 A rough chain marked in to the gaps between verses then all drawn in with gold acrylic and filled with Coerulium blue. Lastly the authors name and my mark added. Then with help from my friends at Ezeframe, a nice frame and mount. All this was worked out between the client, (Sue), and myself by Email so it was good, at last to meet when delivering the piece and to know that she approved of the overall effect. I have since heard that the recipient found it “stunning”. Thank you both. It has been a thought provoking exercise in more ways than one. This entry was posted in Asperger Syndrome, CALLIGRAPHY,CALLIGRAFFITI,LETTERING,HOW TO. Bookmark the permalink. Thanks for posting this. My son has autism and I really needed to read this poem. Beautiful work Bill, and a wonderful poem.